Are You Entitled to a JOB? Let me be quite outrageous and suggest that you’re not entitled to a job. Let me further suggest that because people got jobs for a long time, they began to feel entitled to them. A job, for the most part, is a means to an end. That end is the ability to provide shelter and sustenance for oneself or one’s family, plus provide for the well being if there is anything over. But I think, as a species, we have forgotten the difference between the purpose of work and the difference between work and a job. May I suggest we go back to man’s infancy to see what exactly work was supposed to provide for us and where we were to find this work. In the days of Eolithic, Neolithic, and Paleolithic man, work was quite simple. Man went where the food was, found shelter where it was safe, and there was nobody to tell him he couldn’t do it. He took what he was able to get. If the lion was bigger than he was, he gave up on the lion and went for the antelope. In the days that farming, man claimed a piece of land, and because there weren’t so many people around, there was a lot of land to go around. There were also still a lot of animals to hunt, so pretty much nobody could stop one from working. At this point, I suppose, one couldn’t just go and farm someone else’s land, so ownership became part of the picture. By the time man was working with metal, building towns and castles, quite a few skills had developed. If man knew the skills, he used them in order to earn sufficiently to pay for his board. Then came the industrial revolution and somewhere around there, work became a job. Work was no longer doing something from start to finish and earning the fruit thereof. Instead, man did a small piece of the job (the industrial line) and earned an even smaller piece of the reward. (This was the start of capitalism.) Men now had jobs. Entitlement to work or just a natural progression to finding food and shelter? Throughout man’s history, there was no thought of entitlement to a job. It was a matter of having to do something in order to get something. So if there are no jobs, it’s not a matter of one being entitled to a job. It’s a matter of there being no jobs and there’s not much one can do about it! 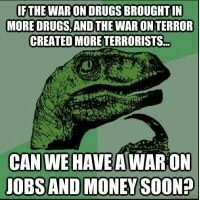 I think the right (and new) question to ask is, "If jobs no longer get us sufficient food and shelter, what will?" The goal of work is simply to be able to feed ourselves, find shelter, and whatever else we need in order to survive, be safe, and enjoy our families and friends. There is no other goal or work. When the meaning and purpose of work is perverted, it becomes difficult to understand where and what one is supposed to be doing in life. How do we feed ourselves and look after ourselves without work? Work evolved with mankind. (And, yes, for the purpose of this piece, I’m using man in the sense of mankind.) If there’s no work to be had, how can other people (government) create work for us? There is no magic wand. We’ve reached a point in our evolution where man evolved in an environment where he could easily feed himself and where we now can’t. In order to feed ourselves now, we have to do things that we didn’t naturally evolve to do, and, consequently, many of us feel stress. If work no longer brings us our food and shelter, what else will? This is the question we need to be asking ourselves. Work had a specific goal in mankind’s infancy. To some degree or another, the end result of work was always related to providing food and shelter. In our time now, work has been twisted to become a means of making money, enhancing status, providing joy, and more. As quite clearly, there are fewer and fewer resources to share with an ever increasing population, the fight for ‘jobs’ gets tougher and tougher, and I’m not sure that work should be equated with providing food and shelter for ourselves – especially when it’s become very much a survival of the best adapted – the law of the jungle. So we have to ask ourselves something here. Is there a social contract? Are we civilized? Or are we just another type of animal and we’re going to fight each other to the death? We could share. We could make a plan. We could share work and share money and resources. Will we? It’s time we thought of another way to provide for ourselves. Can you figure out what that is? One summer during my undergraduate years, I was having trouble scrounging up a job. I needed money fast, so I drew on family connections and applied to America’s employer of last resort: McDonald’s. I was hired within the week. I’d worked kitchens before, so I figured this would be pretty easy stuff. It was and it wasn’t, and it wasn’t because it was. The very first thing that people ask me when I say I am a painter is “Do you sell your work? Are you supporting yourself?” I actually do sell my work, but I do not support myself from these sales. I hate this question and I feel ashamed no matter how I answer it. This is because I always feel like this question is a test; a test to see whether my lifestyle and hobby are legitimate; and money is the gauge of this legitimacy. Is money really where all value lies? Is New Technology Chipping Away at Scope of the American Workforce? So much work to be done; so few willing or able to do it. We have a lot of work to do on this planet. We have to clean up the pollution, find a way of ridding ourselves of a system that enriches some while impoverishing others., and growing food for everybody without damaging our planet further. We could make our world a well functioning garden with sufficient shelter for everybody, educate everybody, and have a lot more leisure than we currently have. Some people will always needs leaders, and some leaders will always abuse the people. So the work that we need to get done isn't being done. If we got rid of the profit motive and started cooperating with each other, it's very doable. We don't lack the tools - just the will. Sadly, there are many who don't see themselves as equal and don't see equality as an end goal. That's on both ends - those who are successful and take way more than they need at the expense of others, and those who aren't successful and who milk the system through crime, abusing social benefits, etc. shining a whole new light.....I really was moved by this article. Thank you for all that you shared here.